LAKE SUCCESS. By Gary Shteyngart. Random House Audio. 13 ½ hours; 11 CDs. Read by Arthur Morey and Soneela Nankani. $40. Also available in print from Random House. Barry Cohen is a hedge-fund manager who oversees $2.4 billion in assets and lives the pampered, extravagant life of the .01 percent in a posh Manhattan apartment with his wife, Seema, and their young son. He’s also a narcissistic, clueless social cripple who has to devise and rehearse “friend moves” to be able to interact with other people. Lately, things in what appears to be his charmed existence haven’t been going so well. He can’t deal with his son’s diagnosis of being on the severe end of the autism spectrum. “Troubled” is too mild a word for his relationship with his wife, Seema. His fund is bleeding money, and the SEC investigation he’s facing could land him in prison. So, after a particularly confrontational scene with his son, wife and their nanny, Barry flees, on a Greyhound bus. He plans to see America and re-connect with his college sweetheart, despite the fact that he has not been in touch with her for years and really knows very little about her. But then, he knows little about anyone, including himself. Seema is a first-generation American who, by all appearances, has it made: She has a law degree, even though she doesn’t use it because she’s a hedge-fund wife with millions of dollars at her fingertips. She’s also stressed about their son’s diagnosis and his prospects, but she deals with her worries in a very different way than Barry does. And she’s bored, lonely and wondering about what her life has become. When Barry vanishes, she doesn’t much care. Gary Shteyngart, who immigrated with his Russian Jewish family to the United States as a child, is known for his satirical novels. Lake Success is largely satirical, and it’s funny, even comic, in places. But it’s also poignant and almost heartbreaking at times. In writing about Barry’s Greyhound trek across the United States, Shteyngart has rich material for satirizing not only the life of a woefully out-of-touch billionaire mogul of finance but also the very idea of the road trip, which has become so iconic in American literature. Barry’s “friend moves” tend not to work so well with the people he encounters on the bus, but he revels in the whole idea nonetheless. More often than not, the people he envisions himself helping do more to help him. And the ideas he dreams up for helping, say, poor inner-city kids, or the young black woman from Jackson, Miss., with whom he has a one-night stand, are absurd. Yet the largely disastrous trip becomes his most cherished memory and oft-told tale. Seema, meanwhile, is dealing with her own problems in a not particularly successful way. She’s done what she was supposed to do in life, but it hasn’t worked out as promised. The backdrop to all this is the 2016 election, the perfect mirror for Barry’s excesses and moral confusion. Barry, whose first step on the success ladder was to go to Princeton, loves the works of F. Scott Fitzgerald; he calls his hedge fund This Side of Capital. 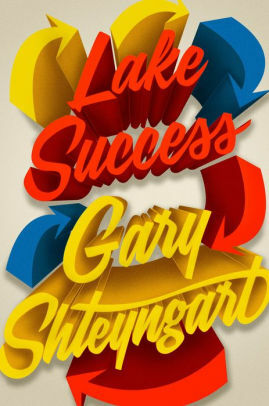 Part of Shteyngart’s genius is to make Barry self-consciously aware of parallels with literature as he sees himself having achieved the American Dream and embarking on a cross-country adventure to find his better self. One of the ironies of the story is that in many ways, Barry’s autistic son becomes more empathetic and better able to deal with social interaction than Barry is. This is a tale for our times, a sometimes funny, often sad, always insightful look at what America really is. The audio version, read by Arthur Morey when told from Barry’s point of view and Soneela Nankani for Seema’s, works well. The narrators give us the story straight and let the satire do its job. This entry was posted in Audio Books, Contemporary literary fiction and tagged audio book, Gary Shteyngart, Lake Success. Bookmark the permalink. One Response to The American dream – or nightmare?